Many continue to argue that the rate normalization taking place now will slow business activity in the US. Good luck betting on that however. There is no question that corporate America had benefited tremendously from extraordinarily low rates. Many US firms have locked in these rates over the past couple of years by refinancing - interest expense savings that go directly to the bottom line. But what will happen now as rates "normalize"? One approach is to see what the markets are telling us. To start, let's look for example at the 5-year tenor where a great deal of corporate America borrows. Over the past year, the 5-year treasury yield has almost tripled. The markets however do not seem to imply slower growth. For example one indicator of corporate activity expectations is the Dow Jones Transportation Index (DJTI) - the oldest equity index that is still in use (launched in 1884). Increased transport usage is thought to precede improvements in industrial activity. When the DJTI outperforms the Dow Jones Industrial Average, the market is expecting stronger corporate performance going forward. 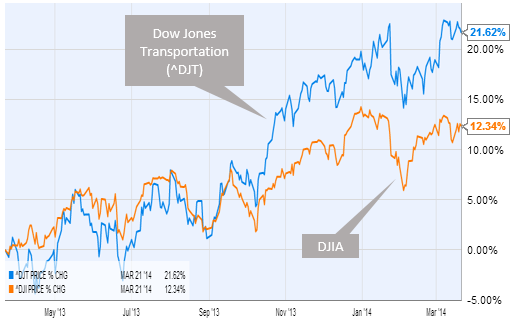 And in spite of significantly higher rates (chart above), the DJTI outperformance has been quite pronounced. Some would say the markets are undergoing a bout of Greenspan's "irrational exuberance". Perhaps. But here we are not talking about the market's lofty absolute levels - only the transport shares' outperformance. Other cyclical shares have been outperforming as well (see chart). At the same time the current treasury yield curve shows the 5-year yield to almost double over the next two years based on implied forward yield (see methodology). Significant rate increases are therefore already priced in. This tells us that at least for now the markets don't view higher rates (rate normalization) as inhibiting growth.